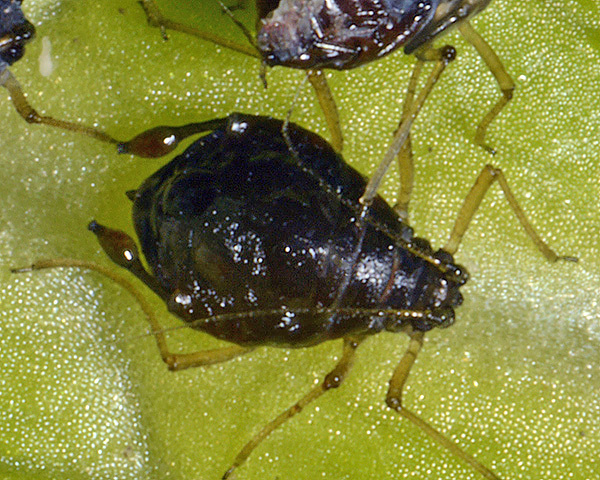 Rhopalosiphoninus are medium sized aphids, either with the frontal region of head adorned with small scabrous spinules, or with the abdominal dorsum more or less sclerotic and pigmented. Apart from a constriction near the apex, the apical two thirds of the siphunculi are strongly and sharply swollen, the apical part before the flange with reticulate sculpturing. The cauda is short and triangular. There are about 19 Rhopalosiphoninus species living on a great variety of plants, including Labiatae, Rosaceae, Iridaceae, Araliaceae and Grossulariaceae. They often live in cryptic habitats near the ground. Some species host alternate, but others remain on one host. 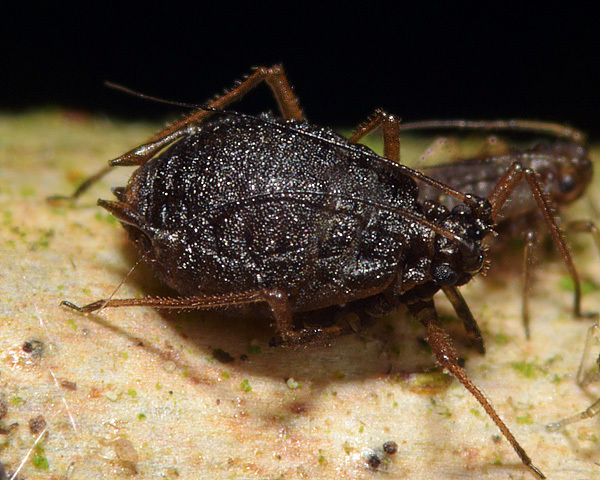 Apterae of Rhopalosiphoninus calthae are shining brownish black. 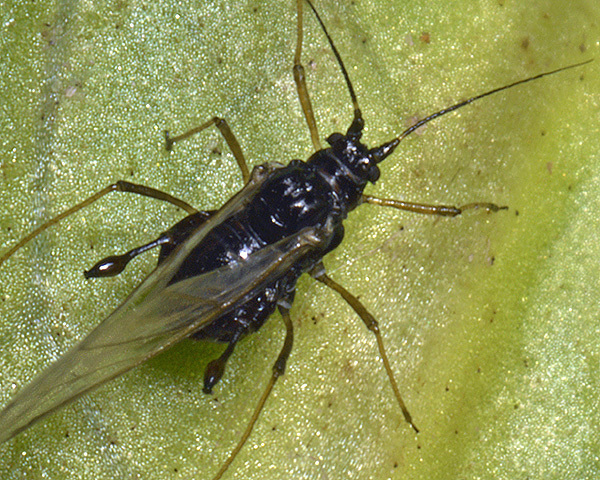 The antennae are dark except for the basal part of segment III, and the legs are yellowish. The dorsum has an almost complete black sclerotic shield. The black siphunculi have a narrow, almost cylindrical stem, which widens abruptly to the swollen half which is about 3 times thicker than the narrower part of the stem. The siphunculi are 3.5-4.6 times the length of the cauda. Alatae have a large black dorsal abdominal patch and strongly swollen siphunculi like the apterae. Immatures have wax deposits, especially over their anterior part. 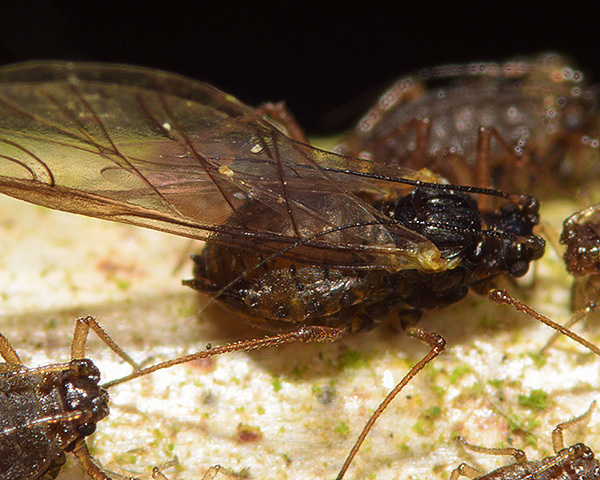 The marsh marigold aphid does not host alternate. It feeds on the underside of leaves of marsh marigold (Caltha palustris), especially those growing in the shade. Sexual forms occur in autumn. The male is small, black and apterous, and the ovipara lacks the sclerotic tergum and has slightly swollen hind tibiae. Rhopalosiphoninus calthae is found over most of Europe.